Today's edition of the Sunday Series is Anderson's guest co-hosting appearance on Live with Regis and Kelly from December 14, 2007. The guests that day were Nicolas Cage and Michael Bolton. We only have the host chat in our archives. If anyone has the entire program and would like to share please email us at the address on the sidebar. Thank you! People.com has a brief snippet of AC & Kelly's interview with Nicolas Cage posted from that day. Here's the link if you're interested. Because we're a little short on content this week we'll include a little treat from the ATA Vault. We don't have an exact date on this clip but our best guess is late 1999 or early 2000. 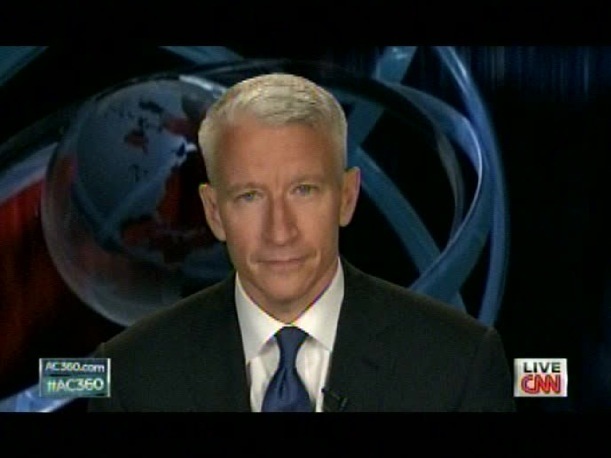 Again Anderson was guest hosting, this time on ABC's World News Now. His mom, Gloria Vanderbilt, made a surprise guest appearance and auditioned for The Mitchellettes. Anderson Cooper was in the anchor chair with all the breaking news on the Debt Crisis. Discussion with Fareed Zakaria who calls Tea Party "anti-democratic"
Anderson Cooper was back in the NYC studio Thursday night, with the all the latest on the debt ceiling crisis. Anderson remained live with the segues for repeats of the Paul & Hoyer interviews before the program went to total repeat and ended with a Perry's Principle. Anderson, Hilary Estey McLoughlin (President, Telepictures Productions), Lisa Morin (Executive Producer, “Anderson”), Jim Murphy (Executive Producer, “Anderson”) — at the Television Critics Association press tour in Los Angeles. Jim Murphy (Executive Producer, “Anderson”, Lisa Morin (Executive Producer, “Anderson”), Anderson, Hilary Estey McLoughlin (President, Telepictures Productions) — at the Television Critics Association press tour in Los Angeles. Anderson at the Television Critics Association press tour in Los Angeles. BEVERLY HILLS - When Anderson Cooper's new daytime talk show debuts on Sept. 12, he says we can expect a lot of New York. But we should not expect much Sept. 11. 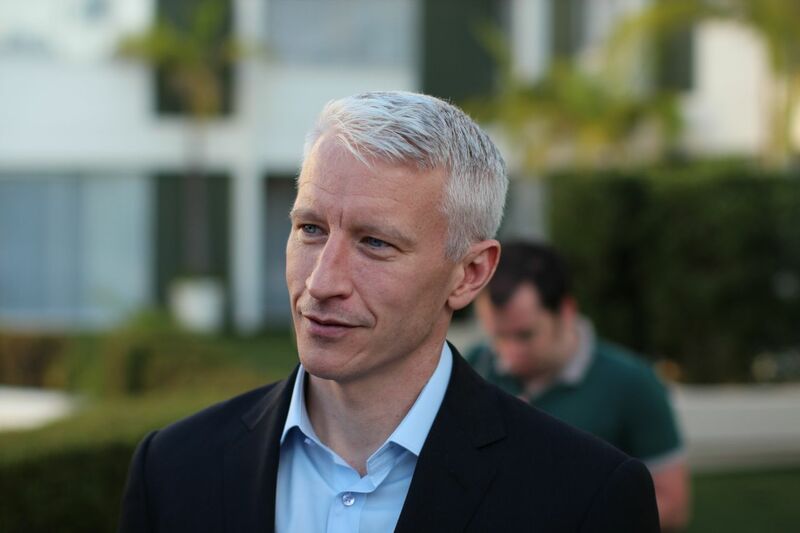 "We will have focused a lot on Sept. 11 in the previous week" on his nightly "Anderson 360" CNN show, Cooper told television reporters here. "My gut feeling is that Sept. 12 is not Sept. 11. It's the beginning of a new week." Anderson Cooper visited the CBS affiliate in San Diego on Wednesday to promote 'Anderson'. Here's his interview on the 5PM news with Barbara-Lee Edwards. Also there were quite a few pictures posted on Twitter of people posing with AC at the news station. If you're interested they're after the jump. We'll have more for you later today. 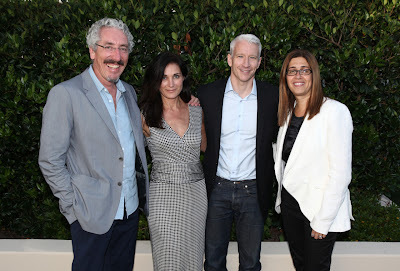 As many of you know Anderson Cooper was in Los Angeles yesterday to promote 'Anderson' at the Television Critics Association's summer press tour. Here are a few of the write ups we came across of his talk at the Beverly Hilton. 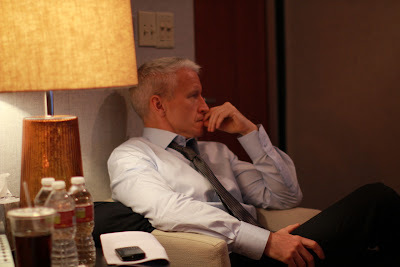 From the "Anderson Backstage Blog on Tumblr"
Good Day LA interview report. Ask Anderson - Where Would You Go? We know our parents, as parents, and forget sometimes that they were children and young men/women with hopes and dreams... Luckily for Anderson, his father was a writer and provided Anderson with some information/insights through his writing. Anderson's father, Wyatt, wrote about his family in his book Families: A Memoir and A Celebration. He wrote not only about growing in Mississippi, but also about his children. Perhaps he was Anderson's inspiration for telling people's stories, giving a voice to those who so often don't have one.... "At my house, the boys watch Walter Cronkite with us every night, and we talk about the rights and wrongs of we see and hear. I don't think it has ever occurred to either of them that their opinions are not being taken into consideration, and I hope that they never begin to assume such a thing." And from a letter Anderson's dad wrote to him shortly before his death, (which he shared with Larry King one night) "We must go rejoicing in the blessings of this world; chief of which is the mystery, the magic, the majesty and the miracle which is life." Perhaps some of his inspiration for 'Anderson'? 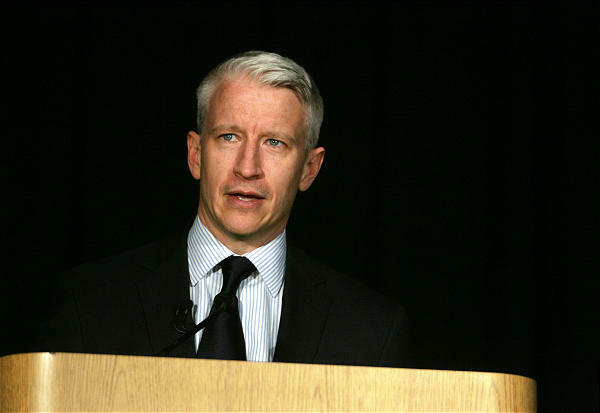 Anderson Cooper anchored AC360 from Los Angeles on Monday night. 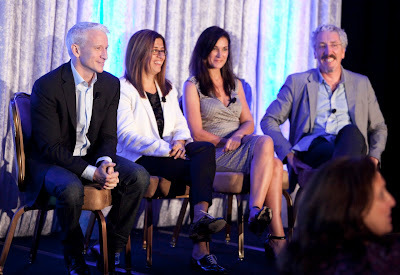 The Wall Street Journal online is reporting in it's Media & Marketing section that Anderson Cooper will speak at the semi annual meeting of the TCA (Television Critics Association) in Los Angeles tomorrow. He's scheduled to appear with his talk show producers Lisa Morin and Jim Murphy. The following commercial caught my attention during Thursday night's AC360. It had been awhile since I had heard anything about Plumpy'Nut. I was happy to learn that it is still being used to fight starvation. In this piece Anderson did in October of 2007, he talked at length with Dr. Milton Tectonidis, the chief nutritionist for Doctors Without Borders. He spoke about the miracle of Plumpynut, "Now we have something. It is like an essential medicine. In three weeks, we can cure a kid that is looked like they're half dead. We can cure them just like an antibiotic. It’s just, boom! It's a spectacular response." And he traveled to Niger to report on how Plumpy'Nut was helping improve the situation in that country. Anderson reported on the famine in Niger in 2005. He wrote about it in his book, Dispatches From the Edge, A Memoir of War, Disasters, and Survival; and we did a retrospective post on ATA in April 2010. In case you missed it, click here. To follow CNN correspondent David McKenzie, reporting on the current drought/famine (from Kenya) on Twitter, click here. 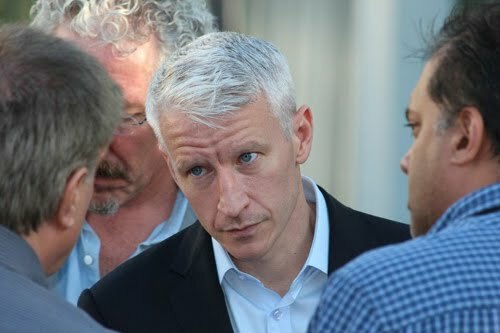 • Anderson has come to the conclusion that they only ask him to be substitute co-host when they have gray haired guests scheduled. • Gelman broke the news to Anderson that he was nominated for a Relly... last year... and didn't win. • Kelly tried her best to get Anderson to play the "Good Evening" game, but he just wouldn't go for it. 2007 was the 20th anniversary of Live with Regis and Kelly. Through out the months leading up to the anniversary show they included flashback segments. This next clip is the history of dance on Live. Now you all know if it's dancing it's going to be an Anderson Cooper free clip (except for the introduction).